When in Manila, there are plenty of women–even Filipinas at that–at the forefront of technology and ready to inspire and encourage more women to be part of the industry. Although highly regarded as a largely male-dominated field, technology is growing to become an avenue for plenty of women to take charge and be involved. After the success of the first DevFest in August, the Google Developers Group Philippines has decided to change the growing divide between women and men in technology. The goal of the event? Meet more like-minded women, promote diversity, and ignite passion within every girl’s heart. So the first ever Geek Girl Manila Meetup was held at the Globe Telecom Showroom in Makati. GDG Philippines, after all, is committed to helping aspiring web and mobile developers to create apps relevant to the community. The organization assists all tech enthusiasts via sponsored workshops, meetups and other events in Bacolod, Baguio, Cebu, Davao, Manila and even Zamboanga. Me and my smug face: The event had limited slots and I was very happy to score a seat! The woman-empowering event was a great opportunity to mingle with some of the inspiring women leaders in technology. Through events similar to this, advancing in the world of business and technology is now made more possible. Here more people will realize that women are just as passionate as men when it comes to technology, whether it be social, web, or mobile. Merci Niebres, Janet Yoon and Aileen Apollo–three of the best ladies who are working with tech-giant Google–were the speakers during the event. Minette Navarette, president of Kickstart Ventures, also offered important and encouraging words to everyone who attended. Lowe Philippines’ Leigh Reyes was also there to show the existing trends in mobile computing. Believe it or not, mobile apps have been used for health and assisted living. Geek girl students attended the event, all eager to listen to the inspiring success stories of the successful women in the field. Connections with other geek girls were also fostered and encouraged along with peer to peer learning. Representatives of local app development companies like Komikasi, tecsoftapps, Codeflux and AppLabs Digital Studios were part of the event as well. Went back to my condo with this freebie: A cool pair of Android earrings! When in Manila, opportunities abound for anyone aspiring for greatness. In this case, over 100 geeky girls were able to share their talents and ideas in celebration of girl power! Watch out for more events from the Google Developers Group! Delightful misery, mad wit, tragic laughter, tangible energy. Catch her on LifestyleManila.com and on Google+. Or, you know, you can just like her Facebook page. Comedy Cebu Brings Two Global Headliners for 3 Shows this March 26-28th- 2 of them Free! Algolympics 2015: An Inter-Collegiate Programming Competition by UP ACM is on its Second Year! 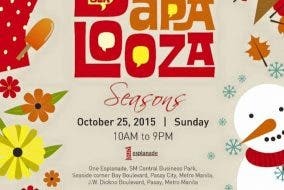 Blogapalooza is Back on its 4th year!